Diversions: What is Cuter than Cute? What is Cuter than Cute? CUTE OVERLOAD! That's what! Come on! You know you can't go to this website and not squeal with cute delight at least ONE TIME. And there is more than just kittens. There is just oodles of cute stuff. I am making an afternoon of this! omg that kitty is so cute. i want it NOW. Aaaack!! TOO CUTE!! I looked at all the kitty pictures. I want a kitty! 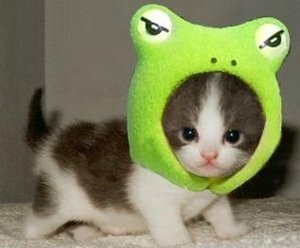 And I want to make it wear frog hats! that cat is adorable. nice blog! oh god, that is FANTASTIC!